Aversive (fear, intimidation and / or pain inducing) dog training techniques. 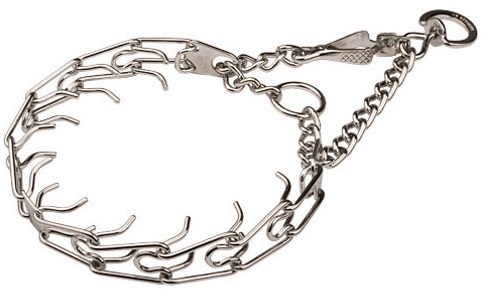 These serve to suppress behaviour (giving the impression of a quick fix) rather than improve your dog's emotional state and address the actual problem. 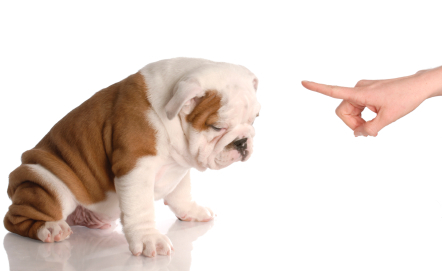 In aversive dog training, handlers try to discourage undesired behaviours by applying an aversive or unpleasant stimulus (positive punishment), and they encourage desired behaviours by stopping the aversive stimulus (negative reinforcement). What are some of the proven Implications of Using Aversive Training Techniques Which Induce Fear or Pain in Dogs? Prong collars can cause serious harm to a dog - the metal spikes are designed to stab into a dogs neck when they pull against the collar. I firmly believe they have no place in dog training - if you have to use damaging, painful and extreme methods like this you are not a good trainer or a caring owner. 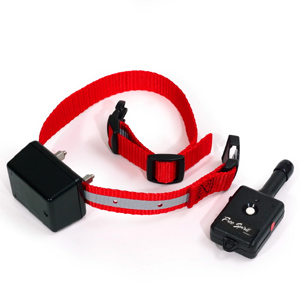 Additionally equipment like prongs and shock collars only work if the dog is in the handlers reach or while worn - the problem still exists. Furthermore, pain inflicting equipment and methods can easily create aggression - often towards the handler in frustration. A key part of positive reinforcement is helping dogs work out problems (big or small) so that the dog no longer feels the need to repeat a behaviour. For example if a dog on a leash growls, barks, lunges and tries to bite another dog, often unable to 'snap out of it'. 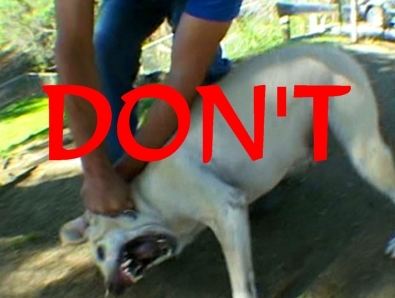 Aggressive techniques in this situation, used by some trainers on dogs, are often labelled as a dog 'submitting'. These methods can include 'pinning', 'punching', 'kicking' in a dogs vulnerable sensitive areas, 'strangling' with leads, 'electric shocks' etc. Now think: The dog's distressed at seeing another dog. If the owner then adds to this distress by harming the dog and making the situation more unpleasant the dog is only going to associate a bad feeling with even more negativity. The dog may appear to 'submit' with force but the 'feeling of negativity' the dog has about the situation is still there and it is now intensified. Therefore the dog can at any time in the future repeat the behaviour and usually with a much higher intensity. By using positive reinforcement and 'shaping' the aim is to reduce the overwhelming stimuli causing the behaviour to a level the dog is comfortable at to give the owner control in lower intensity situations and building up the dogs confidence to a high level of intensity- the dog is taught that seeing other dogs are not a threat and other dogs can actually be a pleasant experience. The dog will also learn to trust its owner in guiding them through upsetting experiences. Dogs who 'behave' based on fear of their owners response are not 'emotionally balanced' dogs. Some trainers will tell owners to show 'dominance' or 'assertive energy' to put a dog 'in their place' and assert the owners place as 'alpha'. This usually involves a human pinning, jabbing, punching or grabbing a dog with little / no warning. However by teaching a dog with aggressive techniques, these trainers are putting vulnerable people and the owners at risk. The dog learns that to take control - physical force is promptly required with little or no warning. Additionally - how can a child who is weaker, 'less dominant' etc ever be an 'alpha' to a dog? Yet you may have seen small children happily walking a big behaved dog on a lead - why? Size does not matter - it's the handler and dogs temperament and disposition that matters! A Chihuahua can 'control' a Great Dane - there's no way a Chihuahua will ever be able to 'pin' a Great Dane yet the Chihuahua might 'rule the roost'. 'Alpha' trainers argue that wild wolves determine who is the top of the pack through fights, size and temperament - but today's domestic dog, although it may have some similar behavioural and psychological traits, is very different to wild wolves (domestic dogs have been domesticated for 15,000+ years). When a dog growls, aggressive methods will insist you to punish the dog for growling. Communication is very important: a dogs growl is the dogs way of telling us, or another animal, that it's unhappy. The dog is simply communicating - some people interpret this as a 'challenge' of their 'status' as 'leader' which is simply not true. If the dog could speak it would mean 'I don't like that' or 'I'm afraid' - not 'I am superior to you and want to be the pack leader'. 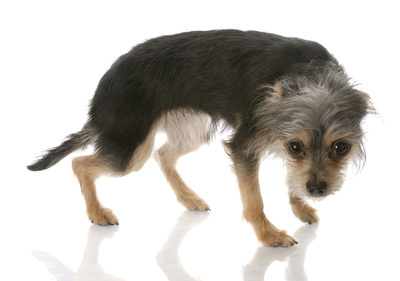 If a dog is pushed further into feeling uncomfortable it may move onto the next step and so on (showing teet, warning lunges then actually biting for example). If you punish a dog from communicating in the lower stages of communication you often get dogs who react 'without warning'. In positive reinforcement we teach the dog that growling is acceptable to help us communicate so there is never a need for the dog to react further. A growl tells the handler the dog is unhappy and the trainer should then take the dog back a step (or a few) until the dog is comfortable - and work their way back up to that point. A good example is with dog-dog communication An emotionally balanced dog will just need to growl at another dog to tell them to go away if they're uncomfortable - and a socialised and balanced dog will respond by going away.There is no fight. If a dog is forbidden to communicate and is forced to pass their mental threshold, fights happen. Some dogs can be extremely subtle In the way they communicate that most owners miss these signals. Positive reinforcement enables a dog to tell the handler 'I'm unhappy and about to react' and the owner can then react with 'I understand, lets move away from this uncomfortable situation and build your confidence up'. Negative punishment: removing a positive stimulus to decrease the likelihood of an unwanted behaviour (e.g. withdrawing the presence of a treat after being ignored by the dog). It's a form of punishment but not a physical or harmful punishment. The word negative” means to take something away and the word “punishment” means to decrease the frequency of a behaviour in training terms. "Beware so called 'dog trainers' and 'dog lovers' who think 'alpha rolling' or 'pinning' a dog will solve any problem. The dogs are dragged to the floor by their necks and held down frightened and confused. Pinning is not the answer for hyperactive dogs, dog aggression, pushy behaviour etc. It teaches dogs to be afraid of the handler, encourages dogs to react without warning and worse. If your dog has behavioural problems please do not resort to this so called quick fix. This week alone I've had a sharp increase in desperate dog owners who've found out the hard way. I've spoken to some of the so called 'experts' giving this advice and every dog in their group were literally terrified every time the handler moved their hand towards the dogs!" I know the 'alpha' technique is very controversial and some people may 'swear' by it. There may be a few people who have physically forced their dogs into a behaviour they want with no repercussions. The sad thing is - people see the 'alpha roll' being used on dogs and they see a dog 'snap out of it' or 'obey'. What people don't realise is what they are actually teaching the dog - that sudden aggression without warning is acceptable. Additionally the problem that caused the behaviour has not been resolved. For example: the dog that was making your dog uncomfortable (so your dog snarled at and pinned) is still making your dog unhappy - but now that you've pinned the dog forcefully to the floor he's scared of you AND the other dog. "Alpha roll advocates often justify the technique because “it’s the way wolves do it,” but that rationalization is weak. As professional dog trainers, we—and ultimately our clients— would benefit from an explanation grounded in critical analysis rather than habit or myth." The theory behind the alpha roll is based on a research study of captive wolves kept in an area too small for their numbers and composed of members that wouldn't be found together in a pack in the wild. Studies of wolves in the wild show wolves only 'pin' another wolf if the fight is serious (usually with intent to kill) and rarely fight within the pack to that extent. Dominance theory has been justified by some trainers as it can make owners act like they have more control over their dog than they may feel. Hard-nosed, brutal efforts to dominate pets can simply cause fear, anxiety and even aggression rather than creating a stable household. A more accurate way of comparing the domestic dog is to feral dogs that are scavengers who live and mate unrestricted by a 'pack' hierarchy. “I find it is rare for them to forcibly push down and hold down a subordinate, a rival, a youngster. In the overwhelming majority of cases, rather than being pushed down, the wolf who ends up on the ground is already going down in response to psychological pressure." "I cannot think of many learning situations where I want my learning dogs responding with fear and lack of motion"
So what are you telling your dog by being a bully? That you are unpredictably aggressive and should be feared of. So instead of showing him that you are a calm, trustworthy leader, you are demonstrating very effectively through aggression that you are a threat, and you’re doing so in much the same way a highly insecure domestic dog would.